From a public policy perspective, however, no state does a better job attracting visitors than Indiana. That’s because its tourism office gets a better return on its investment than any other state. In fiscal year 2012-2013, Visit Indiana had $2.3 million to spend marketing the state, according to the U.S. Travel Association. That year, Indiana took in more than $8.3 billion in tourism revenue, the Census Bureau said. That means every tax dollar spent on marketing and promotion yielded $3,635 in economic activity. Indiana isn’t known for its tourism marketing – where I grew up, just over the border near Chicago, we saw a lot more advertising for Michigan than we did Indiana. But we’re talking efficiency. In 2013, Michigan spent nearly 12 times as much on tourism as Indiana, but got less than twice the tourist spending in return. Indiana doesn’t spend with the big boys, but it apparently gets good bang for its buck. At the opposite end of the list were states like Alaska, Hawaii, Wyoming, Montana and my current home of South Dakota. Those states took in less than $225 in tourism spending for every dollar of promotion. Hawaii, certainly a tourist destination by any definition, was more than 30 times less efficient than Indiana. But those inefficient states all have a few other things in common: they’re all low-population and all fairly remote. That’s relevant because the tourism spending data from the U.S. Travel Association has a very loose definition: it’s all spending by U.S. citizens on trips where they stayed overnight or traveled more than 50 miles. That means if a resident of Brookings, S.D., travels 52 miles south to Sioux Falls for the afternoon, everything they spend there counts as tourism. It’s a lot easier to drive 50 miles to go somewhere than to drive 500 miles or more. That leads to a conundrum for interpreting this tourism data: a state like New Jersey has a lot more people living in that 50-to-100-mile sweet spot than a state like Hawaii or South Dakota, even though the latter have attractions people will travel long distances to see. The more people a state has, the more “tourism” spending it has. In fact, there’s a pretty remarkable, nearly one-to-one relationship between population and tourism spending. Only a few states are outliers — noted tourist states Hawaii, Nevada and Florida have more tourism spending than you’d expect from their population, and Ohio, Pennsylvania and Texas have less. Given that most state tourism agencies are focused on bringing money into the state rather than merely circulating it, this would make me leery of making any judgment about the efficiency of tourism promotion based on raw tourism spending. Instead, a truer picture needs to control for the effects of population and capture these outliers. To understand what’s going on, we need to look at four different factors. 1. Who has the most tourist spending, period? The states with the most raw tourism spending are California, Florida, Texas, New York and Illinois. I’m sure lots of people travel to those states for tourist purposes – California and Florida in particular have lots of attractions, as does New York City. But those states also have lots of their own residents, so tourism is a small percentage of the overall picture. Meanwhile the lowest amounts of tourist spending are all states with small populations. In fact, some of them are known tourist destinations — Vermont (third worst) has ski slopes, South Dakota (sixth) has Mount Rushmore and the Black Hills, and Wyoming (seventh) has Yellowstone. Nonetheless, all of those states have less than $3 billion in total tourist spending. That’s an order of magnitude less than the top five states. As we know, though, “tourist spending” is highly dependent on population. So we’ll look at the fuller picture in a minute. 2. Which states spend the most money trying to attract tourists? The biggest tourism budgets are largely from the biggest states — which have the most money to spend. The one exception is Hawaii, for whom tourism is a necessity rather than a hobby. Meanwhile some states just don’t seem to care very much, spending less than $3 million on promotion. Among these states is Indiana, identified by Wilson as the most efficient tourism promotion state. Given that among the lowest-budget states it has the largest population, you can see where its efficiency comes in. Washington State abolished its tourism department several years ago. Those raw numbers only tell part of the story, though. 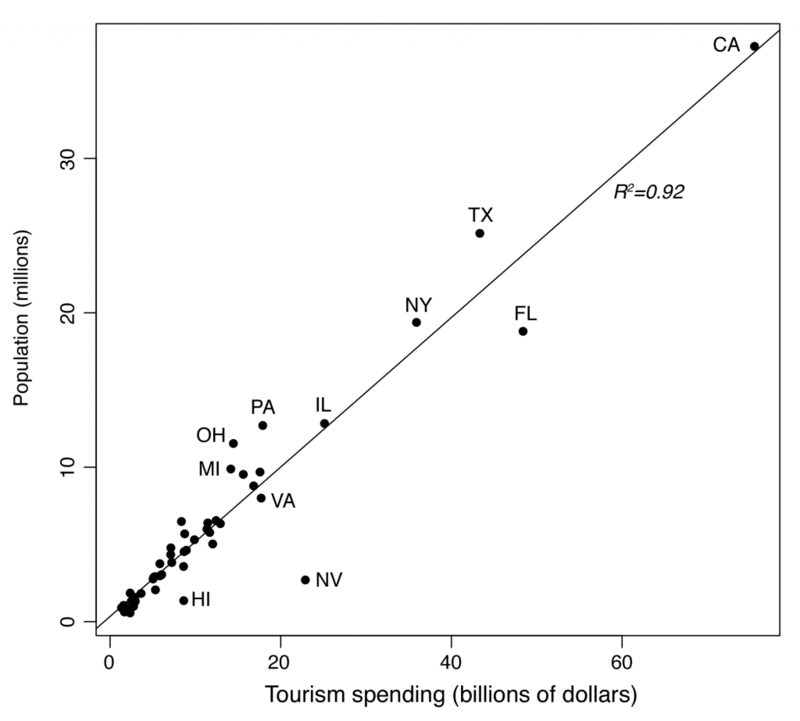 As we know, both tourism spending and state budgets are correlated with population. So let’s control for population and look at per-capita data. This changes the picture radically. 3. Which states have the most per capita tourist spending? Accounting for population in many cases flips the results upside down. The states with small overall tourism were all small-population states. And many of these same states show up at the top of the list when it comes to tourist spending per resident. The leaders in per-capita visitor spending are Nevada and Hawaii, two obvious destination states. After that are many of the small, rural western states Wilson identified as the least efficient in tourist promotion: Wyoming, Montana, North Dakota and South Dakota, along with Vermont. 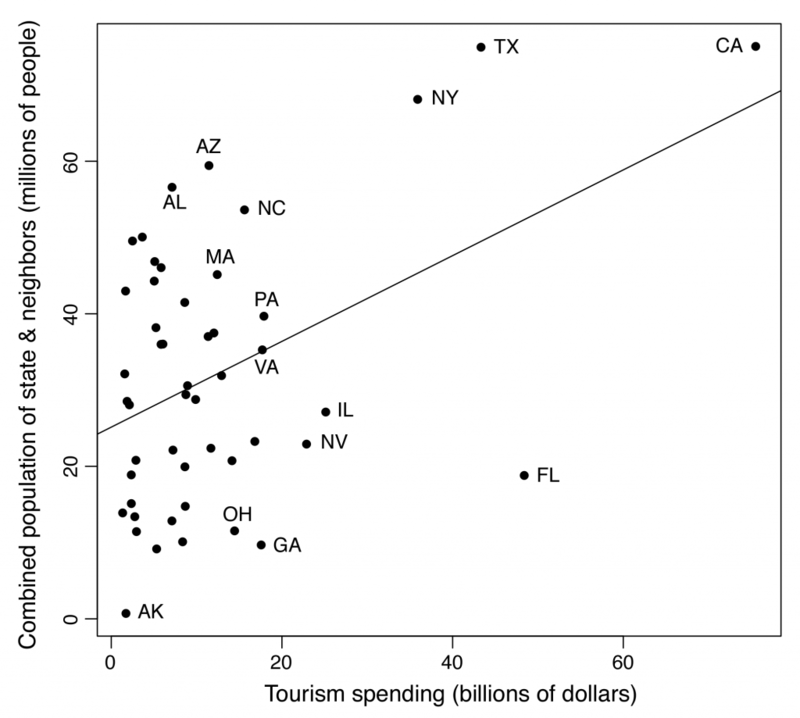 The states with the lowest tourism spending per capita tend to be states with a fair amount of “tourist” raw spending. It’s just that they’re got so many people that tourism isn’t as important as it is for the Hawaiis of the world. Also note that Indiana shows up on this list, too. 4. Which states spend the most money per resident attracting visitors? Hawaii spends more raw money on tourism promotion than any state, so it’s no surprise this small state is also the runaway leader with more than $55 in promotional spending per resident per year. It’s followed by Alaska ($23.94), Wyoming ($22.36), South Dakota ($14.98) and Montana ($12.43). Those are all small states, which inflates per capita numbers, but also remote states that have to work harder to persuade people to visit. Meanwhile, the states with the lowest per capita spending are Indiana, Ohio, Pennsylvania, Rhode Island and Georgia, all of which spend less than a dollar per resident trying to attract visitors. 5. Which states have the most efficient tourism promotion departments, accounting for population? What we’re looking at here is tourism spending per resident per budget dollar. Effectively, we’re taking Wilson’s original calculation (tourism spending per budget dollar) and adding in a division by population. These numbers are very small, so for legibility’s sake, I’ll present them as per capita spending per thousand promotional dollars. By this model, the actual most efficient state tourism agency is Rhode Island, which brings in $2.11 per resident per thousand tourism promotion dollars. Rhode Island, 48 miles long from north to south, probably doesn’t have much intra-state “tourism” spending by the U.S. Travel Association’s definition. Rhode Island has a meager $1.5 billion in tourist spending, second-smallest in the country, but it also has a small population and gets a lot of bang for the buck from its $710,000 annual tourism budget. It’s twice as efficient as the next state. Vermont comes in number two, with 92 cents of tourism spending per resident per thousand promotional dollars. It’s followed by Iowa, Delaware, and Nevada. Indiana, Wilson’s pick, is the sixth-most efficent state, with 57 cents per resident per thousand promotion dollars. That’s still pretty good, Hoosier State! Tourism’s not a big part of your economy, but you’re not throwing money down the drain trying to get that mediocre result. The least efficient states by this metric are familiar: Illinois, California, Florida, Texas and Michigan. Hawaii is the sixth-worst, getting just 8.4 cents of spending per person for every thousand dollars it gives its tourism office. But that’s still better than Illinois’s dead-last 3.5 cents. The other states Wilson called out for inefficiency are all over the map. Alaska is 34th at 14.2 cents. Wyoming is 11th with 33 cents. Montana is 18th with 22.6 cents, and South Dakota is 21st at 21.4 cents. Here are the best and worst states at tourism promotion on this per capita basis. A full list is at the bottom. Interestingly, there’s not much relationship between a state’s tourism spending and the combined population of it and its neighbors. I would have expected states with lots of populous neighbors to do particularly well, regardless of their own population, but other than a few outliers, all the states are clumped in the same range of tourism spending regardless of how populous their immediate region. Note that this doesn’t include populations of neighboring Canadian or Mexican provinces. Alaska and Hawaii thus have zero neighbors listed, only their own populations.